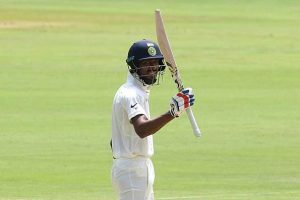 Batting: Shikhar Dhawan 107 off 96 balls, Murali Vijay 105 off 153 balls, KL Rahul 54 off 64 balls, CA Pujara 35 off 52 balls, Hardik Pandya 71 off 94 balls. Bowling: Yamin Ahmadzai 3/51 in 19 overs, Mujeeb Ur Rehman 1/75 in 15 overs, Rashid Khan 2/154 in 34.5 overs, Wafadar 2/100 in 21 overs. Batting: Mohammad Nabi 24 off 44 balls, Mujeeb Ur Rehman 15 off 9 balls. 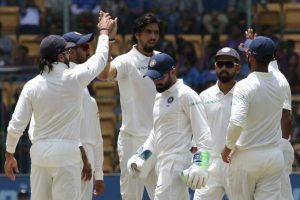 Bowling: R Ashwin 4/27 in 8 overs, Ishant Sharma 2/28 in 5 overs, RA Jadeja 2/18 in 3.5 overs, Umesh Yadav 1/18 in 6 overs. Batting: Hashmatullah Shahidi 36 off 88 balls, Asghar Stanikzai 25 off 58 balls. 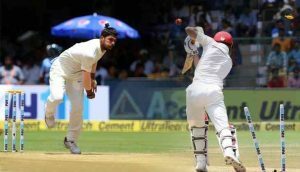 Bowling: RA Jadeja 4/17 in 9 overs, Umesh Yadav 3/26 7 overs, Ishant Sharma 2/17 in 7 overs. 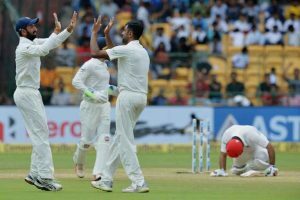 Pandya and Ashwin started Day 2 in hopes of getting India over 450 runs. On the other hand, Afghanistan started off with their spinners hoping to get an early wicket. Ashwin built a 35-run partnership with Pandya but he finally fell to Yamin’s tight line and lengths. Jadeja joined Pandya. Both batsmen shared a 67-run partnership with Hardik reaching an aggressive 50 off 83 balls. Jadeja looked solid but couldn’t hold on and gifted his wicket to Nabi who claimed his 1st wicket of this match. Pandya also got out in the very next over to Wafadar who claimed his 3rd wicket of the match. 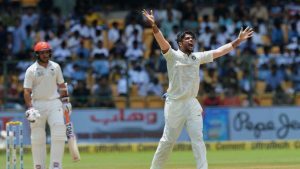 Umesh Yadav joined Ishant Sharma. At, this point India had 440 runs on the board with one wicket in hand. And, in an effort to get as many runs Yadav played a 21-ball cameo after which Rashid took Ishant Sharma’s wicket. India finished their innings on 474 runs. It was now time for Afghanistan’s 1st innings. Afghan openers Mohammad Shahzad and Javed Ahmadi came out to bat and the new ball was give to Ishant Sharma. Shahzad looked in prime form but his lack of running skills cost him as a direct hit from Pandya got him run-out. Javed Ahmadi’s stay on the crease also didn’t last very long as Umesh Yadav claimed his wicket. Afghanistan were now 2 wickets down. Afsar Zazai joined Rahmat Shah. 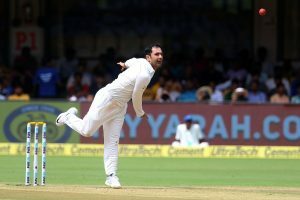 India continued with their pace attack and Yadav claimed his 100th test wicket after pinning Rahmat Shah lbw. Zazai lost his wicket in the very next over to Ishant Sharma and Afghanistan were now heading towards a collapse. The Afghan captain Asghar Staikzai joined Hashmatullah. Both batsmen showed resistance for some time and shared 15 runs between them. 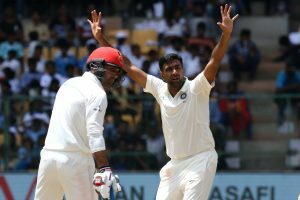 But as soon as Ashwin was introduced into the attack, he struck in his very 1st over and shattered the Afghan’s captain stumps. The all-rounder Nabi joined Hashmatullah. Nabi stayed for a while but wickets started to fall from the other end to spin. First, Hashmatullah fell to Ashwin, then Jadeja claimed the wicket of Rashid and 2 overs later Ashwin’s carrom ball gave him the wicket of Yamin. At this point, Afghanistan had only scored 87 runs for the loss of 8 wickets. Nabi took his team close to a century. And after he became a victim of Ashwin, Mujeeb struck a couple of boundaries off Jadeja’s bowling to get Afghanistan over 100 runs. But, Jadeja got him out in the very same over. And, Afghanistan’s innings ended on 109 runs. India decided to enforce the follow on and it was time for Afghanistan to bat again. After tea, Afghanistan openers Shahzad and Ahmadi walked out to bat again. Shahzad made a quick start but once again lost his wicket too early to Yadav. Javed Ahmadi and Mohammad Nabi became the next victims of Yadav’s fiery bowling followed by Rahmat Shah who got out to Sharma in the next over. The Afghan captain, Ashghar and Hasmatullah troubled the hosts for some time and laid a 37-run partnership between them. But, after playing 13 dots, Asghar’s impatience got the better off him as he holed out to Dhawan; courtesy of Jadeja’s bowling. Zazai joined Hashmatullah but his wicket was also taken by Jadeja in the very next over. Rashid Khan joined Hasmatullah and after showing some resistance Jadeja shattered his stumps. India were now only 3 wickets away from victory. 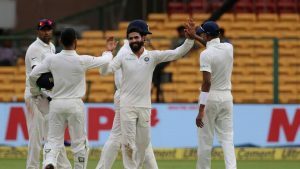 Hasmatullah remained unbeaten but Sharma, Jadeja and Ashwin claimed the last 3 wickets in quick time and India won the test match. One of the biggest pluses was the length that Ishant Sharma bowled. The overs behind him in county cricket have helped. Harsh welcome for Afghanistan to test cricket and the realisation that this form of cricket requires very different skills. India won the match and Afghanistan won our hearts!! Lol Afghanistan defeated in two days. Got out twice in a single day. Wtf. Who allowed them to play test cricket. What were you thinking @ICC? India Vs Afghanistan – Test Match ended. Join Allsportspk tomorrow for Day 2 of India Vs Afghanistan Only Test match. Next articleBreaking: World Cup 2018’ Iran Vs Morocco: The Winner is…?